The Rocky Mountaineers maintain a small unimproved cabin on "Little St. Joe" a point to the east of St. Joseph's Peak in the Bitterroot Mountains. 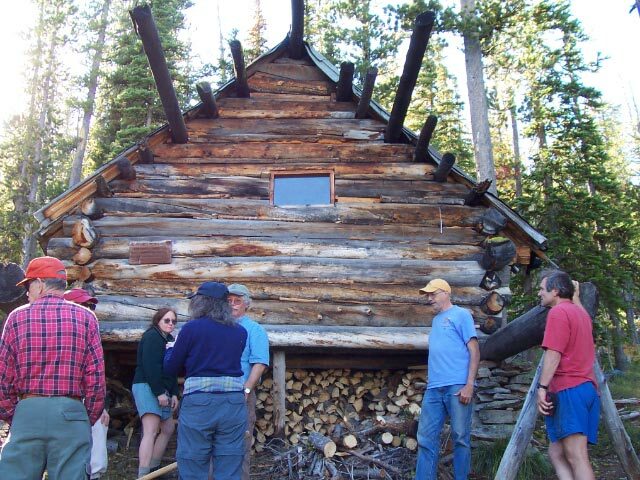 It was built of logs in the 1970's by club members Bob Benson and Bill Morgan, to replace a cabin across the Bass Creek drainage at Lappi Lake that was in the Selway Bitterroot Wilderness area. Club members hauled a wood stove up, quite a task considering the cabin is not accessible from any roads or by snowmobile. Unimproved means that the cabin has some unchinked walls, a minimally sheltered pit toilet and no water. Nor is there a source of water close to the cabin which is generally not a problem as the lease we have with the Forest Services specifies winter use only. That is: when there is snow on the ground. The trail to the cabin is not distinguishable or signed where it leaves the main St. Joseph's Peak trail, but many members know how to find it and use it frequently, mostly to back country ski or snowshoe in the area. Members can contact an officer to get directions on how to get to the cabin. Also, please check the Rocky Mountaineers Calendar of events before heading up to the cabin to ensure availability and reduce overcrowding. 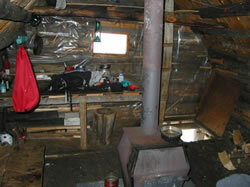 The cabin is entered by a trap door from beneath the where fire wood is also stored. Club Members do a yearly work day to cut wood and do maintenance. The cabin can sleep six people comfortably on platform beds. A few pots and pans and some games are stored there. Use of the cabin is free for Rocky Mountaineer members only, but donations are encouraged by frequent users to help with the cost of maintaining the cabin. Donations can be made via The Rocky Mountaineers Paypal LINK. If you would like to use the cabin, join the club at the same link.